Today we’re traveling back south to my favorite region for landscape photography, the rugged and beautiful St. Francois Mountains. This location, known as Elephant Rocks, is located in Iron County and lies about six miles north of Ironton and two miles west of Graniteville. By the names of these towns can you figure out what the principle economic activities of this area were historically? The primary features of this location, the elephants, are easy to see in the image below. So what are these “elephants” and how did they get there? 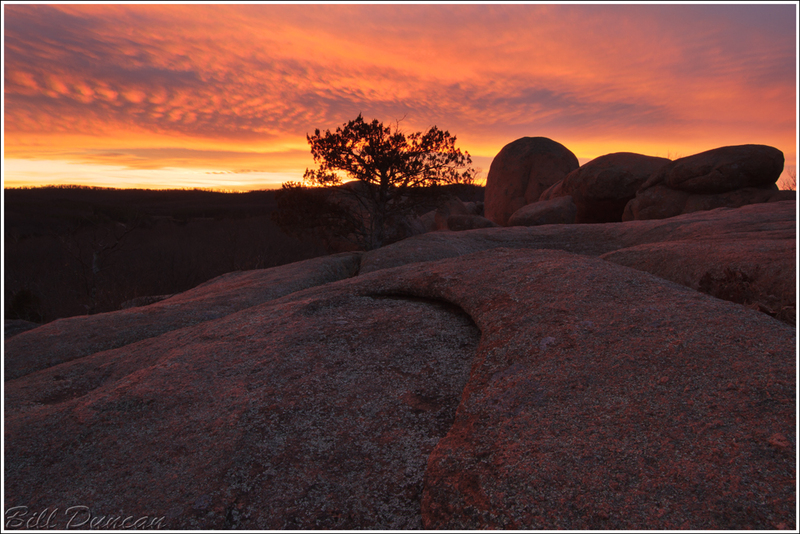 Well first of all these rocks are composed of a pink-colored, Graniteville Granite, or more affectionately known as “Missouri Red Granite”. Geologists discern between different types of granite based on mineral grain-size and color. 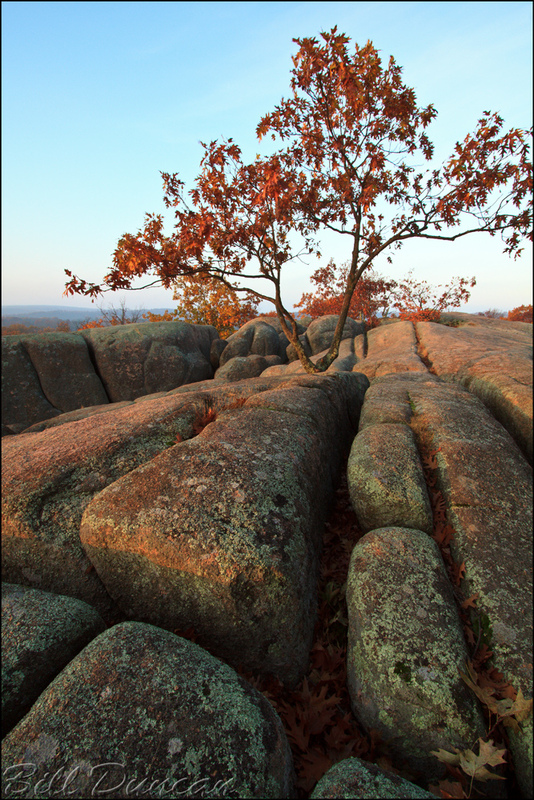 Missouri Red is actually one of the younger granites of the St. Francois Mountains, coming in at a mere 1.3 billion years. Missouri Red, collected from quarries surrounding this feature was used as paving stones that covered most of St. Louis near the turn of the 20th century. It was also used in parts of the Eades Bridge, the Jefferson National Expansion Memorial, the Missouri Governors Mansion in Jefferson City and in important buildings across more than a dozen cities in the United States. It is still quarried today and used mostly for tombstones and counter-tops. So, if you are reasonably educated in the discipline of geology and you were forced to guess how these boulders managed to be found here your first answer might be to suggest those great marble movers – the glaciers must have moved them here from up near Canada, right? Sorry, the southern limit of intrusion of those sheets of ice was about where the Missouri River now flows about 150 miles or so to the north. Hints upon the excepted mechanism of formation can be seen in the image above. These boulders were formed by a process known as “spheroidal weathering”. Before you reach for that tube of Preparation H, let me try to explain. Sometime in the Pre-Cambrian molten rock was forced into the earth’s crust. As the rock slowly cooled it formed long, nearly vertical joints, or fractures. As time passed these rocks were covered with younger, sedimentary rocks. When the Ozark Plateau was forced upward the resulting streams cut their way through this younger rock and eroded much of it away. Erosional ground waters acted on the corners and edges of these granite joints quicker than on the surfaces and gradually increased these joints. 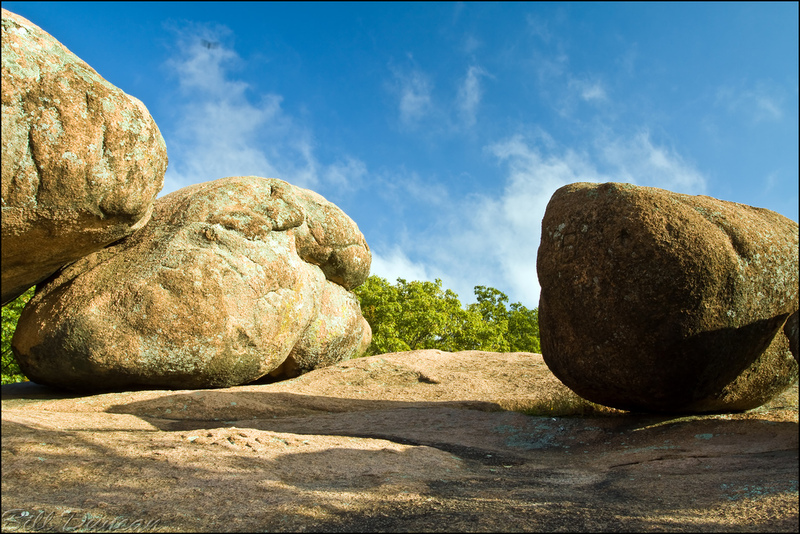 When the rocks were later exposed to the surface, erosion and weathering acted much quicker in forming the clean and rounded features of the boulders. Plant life (tree and grass roots, lichen, etc…) also helped to chip away at the surfaces of these future boulders. 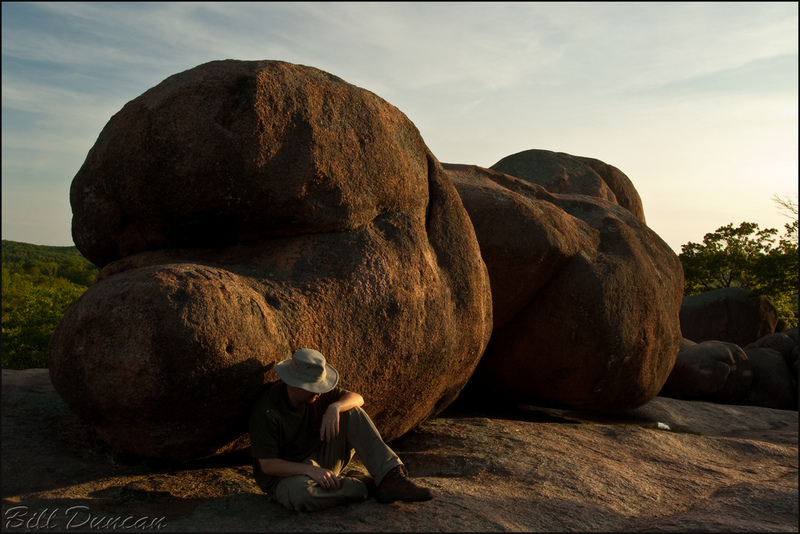 Eventually a tor – an exposed mass of bedrock, was left with these elephantine boulders now widely separated. Above you can see one of the more famous pachyderms who make this site their home, “Dumbo”. This guy measures at about 27 feet tall, and with the incredible density of this granite (~160 lb per cubic ft) weighs close to 680 tons. Not even the people of the “it will never run out” period of western U.S. expansion would destroy something as unique as Elephant Rocks. 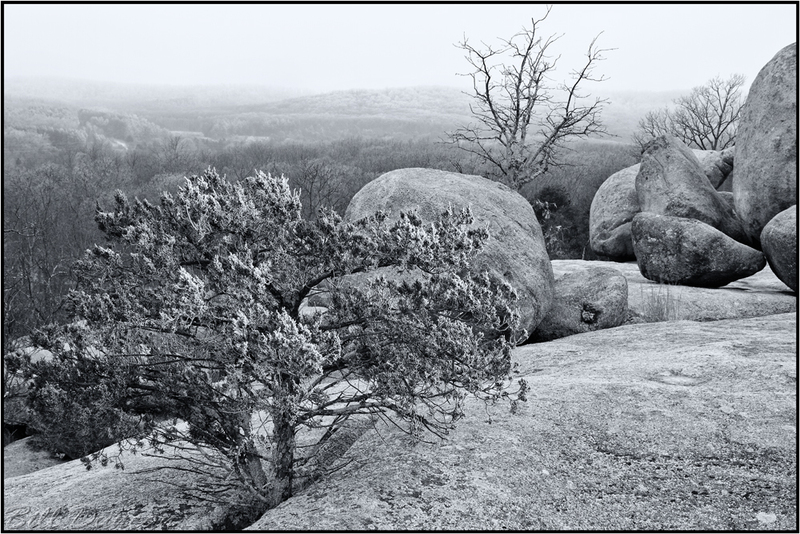 Although there has been mining of granite, iron, lead and other minerals throughout this area, Elephant Rocks still looks pretty much as it did 200 years ago. When a quarry worker reached “master stonecutter” status they would carve their names here upon the boulders and bedrock. This gives the place an interesting human historical aspect. Today, this location is protected as a Missouri State Natural Area and a State Park. There is a very well done ~mile paved “braille trail” that circles through many of the features of the park. The trail’s meandering allows the blind to feel some of the geologic features and braille signs are posted to explain what the person is experiencing. I find this to be a fantastic development. In my opinion our country does nowhere nearly enough to help the blind and these people are often forced into greater dependence and exclusion because our government refuses to take the smallest of steps. Ever notice how the US paper currency is all the same size? The tinajita, or panhole like those pictured above are more evidence of the weathering this exposed porphyry is being subjected to. The process of seasonal freezing and thawing as water seeps ever deeper into minute cracks forms these shallow depressions that fill with water in wetter times allowing for animals like insects and frogs to have places to breed. Elephant Rocks. 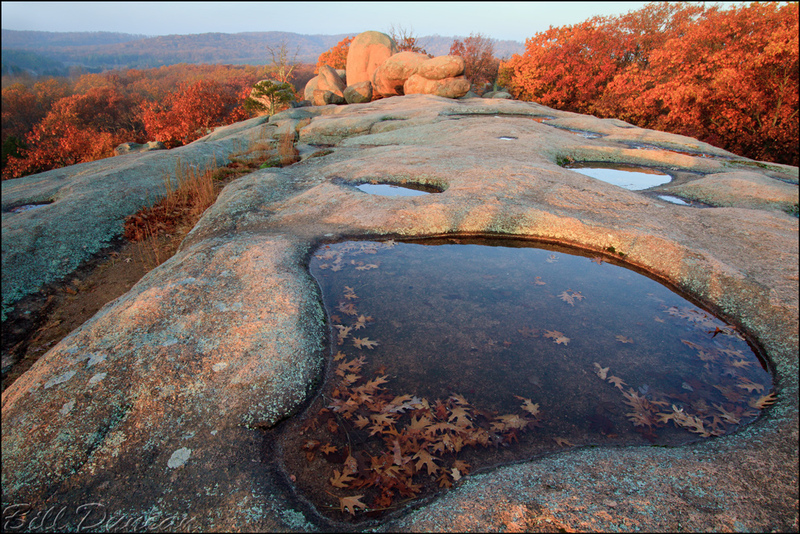 It comes as no surprise to those who live in the region – everything in the mid-western United States, but particularly the Ozarks is often overlooked in favor of the grand natural spectacles of the Rockies, the Appalachians, the South-West’s deserts and canyons, etc… Well, Elephant Rocks is one location that should be on the bucket lists of any tourist, any rock-star landscape photographer or nature enthusiast. It is a location deserving of being voiced-over by a James Earl Jones, Alec Baldwin or Brangelina in the nature documentary of the week. I hesitate to scream too loudly, however. I have loved the times I’ve been able to spend hours here without seeing another bipedal ape and hope for many more. I’ve called this the place of unlimited compositions. I have been fortunate enough to make a few images I really like and I look forward to many more visits over many more years to come to see what other compositions the place is hiding. 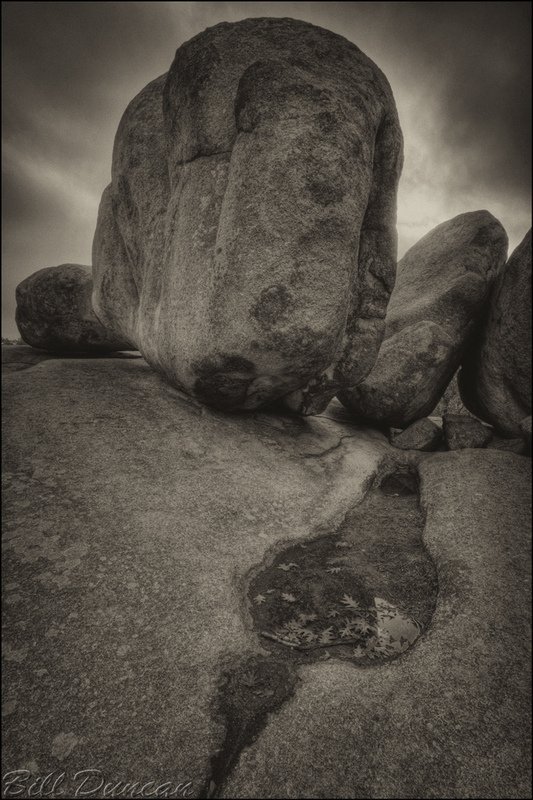 You can view more of the photographs I’ve taken at Elephant Rocks.